Want to buy an action camera but don’t have enough budget to buy an expensive GoPro camera? Do you want to buy a camera which has got same specs as a GoPro camera but has a cheaper price? Do you want to take different beautiful shots with the help of best action camera at a reasonable price? Don’t worry we have got it all covered for you as we will talk about some of the best cameras like GoPro but in a cheaper price range. GoPro cameras provide many features but that’s a fact “They are pricey as well”. Yeah, a GoPro camera can cost you something around 350$ to 400$ easily. So, why not buy a camera which provides almost same features as that of a GoPro action camera but has a low price range? These cameras have got almost all the new and updated features as that of a GoPro camera but they have fairly less price which makes them affordable. You can buy them easily even if you are on a short budget. 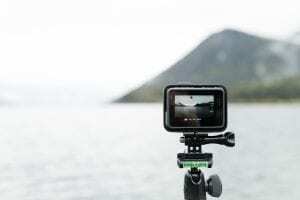 Well keeping the demand of best cameras like GoPro, we have decided to compile a list of the 5 best action cameras like GoPro which have almost all features as that of a GoPro camera but are a lot cheaper than them. The cameras we have listed are properly researched on the basis of their, high-quality video recording, performance, durability and user ratings so that you can make a decision right here, right now. Well, without further ado, let’s take a look at some of the best cameras lie GoPro but in a cheap price range. Campark ACT74 action camera tops our list for being the best camera just like GoPro. It has got the same design as that of a GoPro camera and has got all those features which will make you forget the GoPro camera. The camera comes in with a very reasonable price range and it only costs only less than 50 bucks. It has got an ability to record UHD video in 4K resolution at standard fps rate just like a GoPro camera. The camera has got a 16MP image sensor as well which lest you take high-quality images without any worries. Campark Action Camera will help you a lot in capturing your action skills and sharing it with the world. Campark action camera is waterproof. Just like a GoPro camera, it has got a waterproofing ability for up to 30m depth which will let you enjoy the video shots in deep water easily. 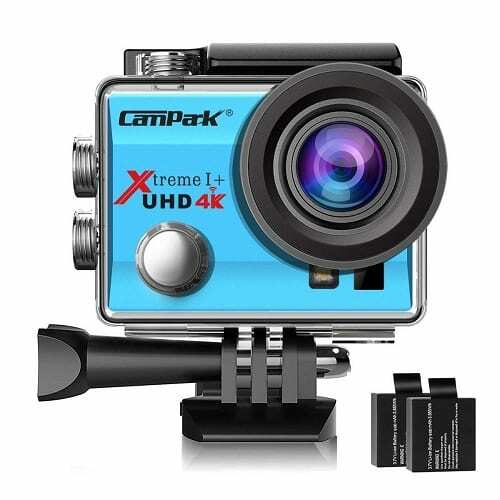 The camera is ideal for water sports such as swimming, snorkeling, and skateboarding etc. On the other hand, you can also use this camera to record high-quality shots while you are on a hike or an adventure. The camera comes in with a built-in Wi-Fi which lets you share your video and image clips on social sites easily. Furthermore, it has got a 2 inch HD screen which helps you to navigate different options easily. The 170° wide-angle lens lets you take video shots at almost every angle. Perfect for swimming and snorkeling. Campark Action Cam is the best camera just like a GoPro and has got almost all the features that most of the GoPro cameras have. This camera allows you to take high-quality video shots with ease and convenience. Go for it if you need the best action camera in a very reasonable price range. YI Discovery Action camera is another best camera with features just like a GoPro cam but available at a very reasonable price. The camera has got very advanced features and has a very compact design as well. YI Discovery camera has got a sturdy and unique look. It has got a 2″ HD touch screen which makes it easy for the user to access different options. The touch is responsible and it gives a feel of using a smartphone. On the other hand, it is able to record UHD video of 4K resolution at about 20fps and 1080p resolution at 60fps. The camera comes in with a 16MP Sony Image sensor which allows you to take beautiful and high-quality images as well. On the other hand, the 150° wide-angle lens allows you to take videos from different angles easily. The camera has got a waterproofing ability. It is waterproof for up to 40 meters which are quite exceptional. The waterproofing ability makes it perfect for shooting videos in deep water. On the other hand, it has got wireless compatibility. The Wi-Fi feature is available which allows you to connect the camera to the internet and share your videos and images on different social media platforms easily. The camera has got 8 shooting modes which means you can now shoot with a good potential in almost every environment. Action Camera just like GoPro. 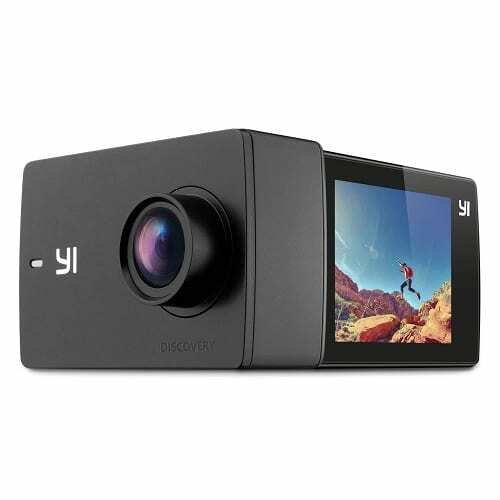 YI Discovery action camera is one of the best cameras just like GoPro which allows you to take high-resolution videos and photos with smoothness and ease. It allows you to record different beautiful and memorable moments with convenience. Go for it if you need the best action camera just like GoPro in a very reasonable price range. NEXGADGET Action Cam is a camera with a design similar to a GoPro cam and is perfect for taking high-quality shots with ease and convenience. The camera has got an ability to shot videos in full HD quality so that you can share your memorable video clips with friends and family. The camera records in full HD 1080p at a constant 60fps rate. Although it’s not able to record in 4K resolution still the recording quality is above average and mind-blowing. The camera has got a 14MP image sensor which allows you to capture beautiful images without any worries. Furthermore, it has got a 170° wide angle lens allowing you to shoot videos from different angles easily. The camera has got a set of two rechargeable batteries which provides a good backup in case your action cam battery drains out fast. The best camera has also got a 2.0″ LCD screen which lets you navigate different options easily. There is a variety of shooting modes available in this action camera which allows you to shoot videos like a pro and you can take unique video clips with the help of these modes as well. 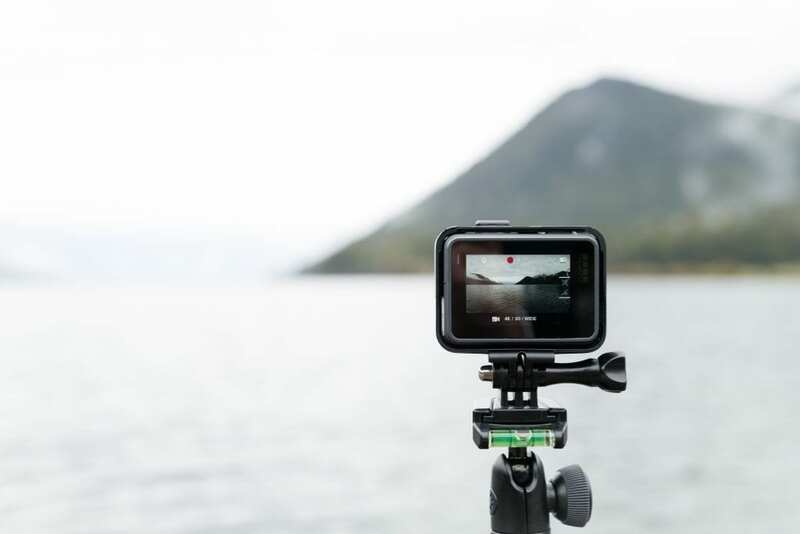 The shooting mode is ideal when you are about to shoot videos in time-lapse mode, cycling mode, slow motion and video shooting for a longer period of time. The action camera has got a car mode which allows you to use this camera as a dash cam for constant video recording without any worries and issues. The camera has got a waterproof, dustproof and abrasion proof design. It has got a waterproofing ability for up to 30 meters which is quite exceptional. you can use this camera to shoot videos in deep water easily. The camera is perfect for swimming and snorkeling as well. Last but not least, free mounting kits are also available which is used to mount camera easily on different positions. Design just like a GoPro. Waterproof design(up to 30 meters). NEXGAGDET Action Cam is the best camera which allows you to shoot high-quality videos with ease and convenience. it allows you to capture beautiful images as well. go for it, if you need the best action camera just like a GoPro cam in an affordable price range. Ion 1011L Air Pro Lite is an action cam which has got a very compact design and is able to record high-quality videos with ease and convenience. 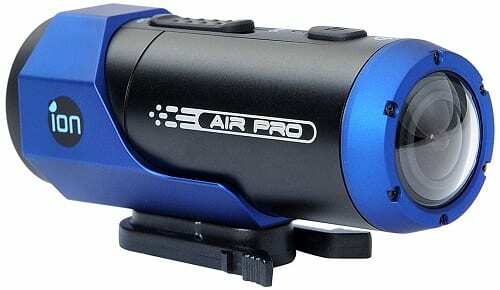 The camera has got premium quality materials and has got a cylindrical shape, unlike other action cameras. It has got a 170° field of view which allows you to take wide angle shots easily. On the other hand, the camera is portable as well. You can take it anywhere you want without any issues. It has got a good video recording quality as well. The camera allows you to take full HD 1080p at 30fps and HD 720p video at 60 fps rate respectively. The most absurd feature too look at in this camera is its built-in microphone. Yeah, you heard it right. This camera has got a built-in microphone which lets you record the audio of the video clip easily. The burst shot mode and time-lapse modes are also available which let you make high-quality action videos easily. The camera has got a waterproofing ability. It is waterproof for about 10 meters or 30 feet which is quite good. Though it’s not as good as other action cams still provide a good water depth feature so that you can take high-quality videos in deep water. MicroSD card slot is also available and it can accommodate a memory card of 32GB only. The action cam comes in with a warless connectivity. The Wi-Fi allows you to share your videos or images through social sites easily. Time-lapse and burst shot mode. 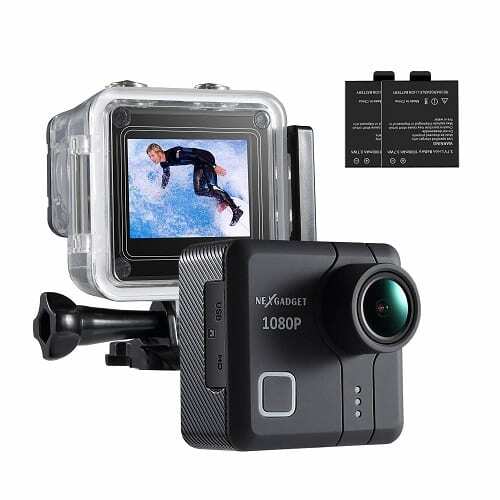 Waterproof up to 30 ft.
Ion 1011L Air Pro Lite is an action camera which has got a compact and durable design and is able to provide you high-quality video recording and image capturing feature as well. Go for it if you need an action camera having features like a GoPro camera in a good price range. If you want an action camera with a very small and compact size, Polaroid Cube+ is there for you. 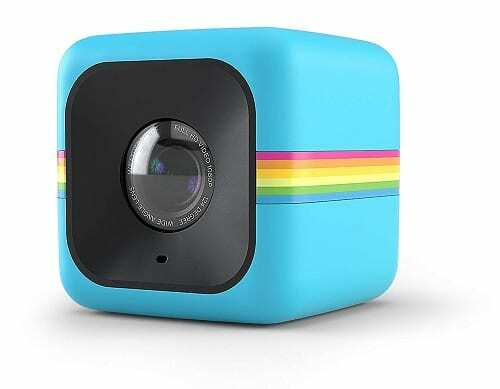 Polaroid Cube+ is the world’s Funniest, Coolest and smallest lifestyle action camera which allows you to take high-quality images and videos at a good frame rate. The camera is able to provide a video resolution of 1440p, 1080p and 720p respectively. Moreover, it has got an 8MP image sensor which allows you to take clear and sharp images easily. The camera has got a compact design and it’s very portable. It can slide easily in your pants pocket easily. There i.e. a built-in rechargeable battery available which provides a time period of 107 minutes for continues shooting on one complete charge. The camera has got wireless connectivity. The Wi-Fi available in this action camera allows you to share your videos and photos on different social sites easily. Moreover, it has got 124° wide angle lens which allows you to take shots from different angles easily. The magnetic clip mount allows the camera to be attached to magnetic surfaces easily. Furthermore, it also comes in with a microSD card and Polaroid Bumper Case. Polaroid Cube+ is a versatile action camera which has got the features of a GoPro camera and is able to provide high-quality video recording easily. go for it if you need a compact and portable action camera in a reasonable price range. Well, we have done our part and now it’s your turn to buy the best camera just like a GoPro camera. The camera we have listed have all got a price range of fewer than 100 bucks and we are sure that you won’t face any budget issues in selecting the camera. If you want our recommendation, we will advise you to buy the brand new Campark ACT74 Action Camera which has got almost all specs like a GoPro camera and has a reasonable price as well. So, make your choice and buy the best action camera to start capturing beautiful shots with ease and convenience.